It may seem like a distant memory now. But the first action taken by Port Hope council under his leadership was the cancellation of the ENTECH REM incineration project that was being planned for Wesleyville Village. Port Hope successfully dodged a bullet in that one. Under Bob’s leadership, Council moved quickly to reorganize the entire administrative structure of the municipality. The high-salary CAO position has been vacated, and the number of department heads has been reduced from seven to five. The ongoing reorganization will shortly add a sixth department, focused on Community Development. It will amalgamate Planning, Tourism and Economic Development. director is yet to be hired. The savings from these administrative reforms amount to approximately $300,000 a year or over $1.4 Million over the 4-year term. Collaboration and efficiency has been much improved with department heads working together in executing the direction of council. The long awaited PHAI low level radioactive waste cleanup is finally underway. It will affect every person in Port Hope one way or another. Mayor Sanderson has been the lead on this file. He will continue to personally lead our municipal team of four professionals whose mandate is to ensure Port Hope’s municipal requirements are met and that the project is completed safely and on time. The cost of these four positions is funded entirely by the federal government and there is no impact on taxes. Another accomplishment of Council has been the recent purchase of Lakeland Place beside our Town Hall, which with allow us to potentially form an “administrative campus” for the Municipality. This reorganization would centralize municipal services in one location. This campus approach addresses efficiency, cost of operations and ease of use for citizens, with the added value that when completed, it will be part of the beautification of that part of the riverside. Economic growth is one of the most important keys to sustaining a viable community, but it does not come without hard work. Port Hope needs a strong reputation for providing support for new business ventures at all levels. And in fact over the past four years Port Hope has been seen by many as a great place to establish, build or move a business. This is a significant change from the period when our business park sat empty, as did many of our commercial buildings.. We are currently experiencing strong private sector economic investment because business has renewed confidence that Port Hope is a good place to invest. • A new medical clinic has opened on Henderson Street). • Maple Lodge Farms is expanding, and there are plans for an 80 room Hampton Inn hotel. • Other business expansion includes two auto dealerships, a new KFC, and a new gas station. • The Central Public School has been purchased by a condominium developer who plans to provide more downtown housing for seniors, and assisted living services. • The former Nicholson File building has been purchased, and we will work with the new owner with the intention of seeing this long-deserted industrial building repurposed. • The site of the former vacant Canadian Tire store is being redeveloped. • A micro-brewing company has purchased the empty lot on Mill Street just south of the Skeena building. • The retirement community housing near Wlaydka Park is expanding. Much of this investment is occurring because we have invested in ourselves over the past several years, confident in our future. And because our Mayor can make the tough decisions sometimes required. Now is not the time to change leadership! 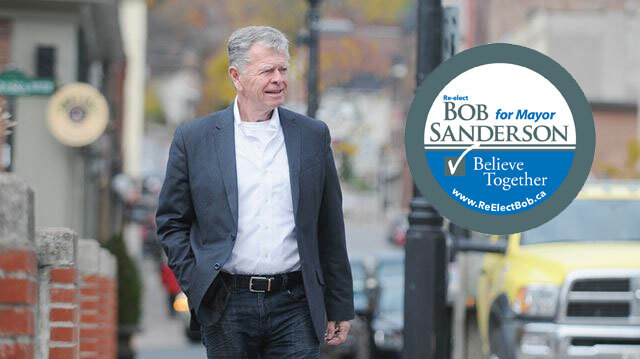 Be part of the ReElect Bob for Mayor Campaign! 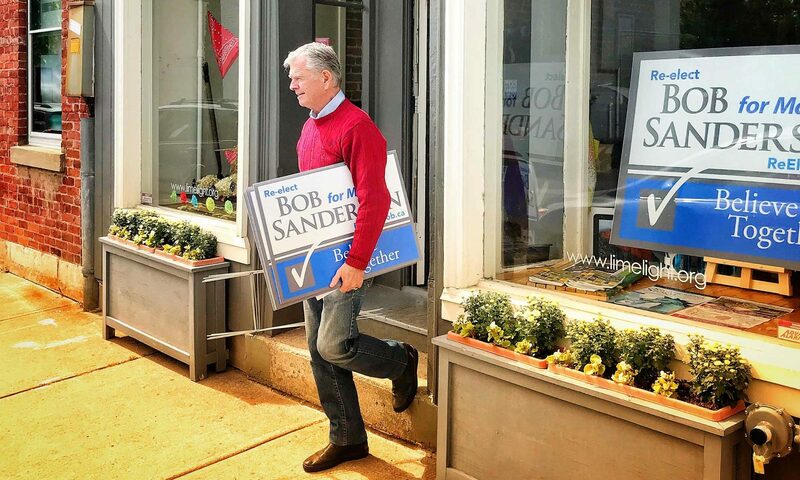 Volunteer, Get a Lawn Sign, and/or Donate!